Discussion in 'Wheels & Tires' started by csuviper, Jan 10, 2014. 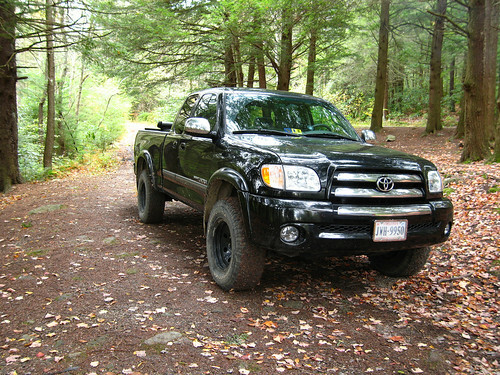 Show off your awesome wheel and tire setups on your Tundra. Help those that are looking for wheels and tires to find the right setup. Please post up pictures of your wheel and tire setups. We would love to see them. Provide all the info you know such as manufacturer, model, size, offset, backspacing. I will post wheel and tire picture combinations that I can find in the OP to help out as well. Please let me know if you see missing or incorrect information in the OP and I will get it changed. Note: These recommendations are based on the factory wheels. Using an upgraded rim with different backspacing will allow you to increase to a wider tire. With a 3″ lift kit, the options continue to get better. However, the wider the tire, the greater the likelihood of trimming. 16″ rims: 285/75 R16 – slightly more than 2″ taller than factory, this tire is 8/10ths wider than factory as well. This width may be problematic in tight turns and/or at full suspension compression. 17″ rims: 285/70 R17 – slightly more than 2″ taller than factory, this tire is 8/10ths wider than factory as well. This width may be problematic in tight turns and/or at full suspension compression. 18″ rims: 285/65 R18 – 5/10ths taller and 4/10ths wider than factory. Trimming may be necessary. 18″ rims: 275/70 R18 – One inch taller but same width as factory. 18″ rims: 285/70 R18 – 4/10ths wider and 1.7 inches taller than factory. Trimming may be necessary. 18″ rims: 295/65 R18 – 1 inch taller, 8/10ths wider than factory. Trimming is probably needed due to width. 20″ rims: 285/60 R20 – 4/10ths wider and 1.5 inches taller than factory. 18″ rims: 285/75 R18 – 4/10ths wider and 2.8″ taller than factory. 18″ rims: 305/70 R18 – 1.2 inches wider and 2.8″ taller than factory. There are Tundra owners running this size, but trimming is required. 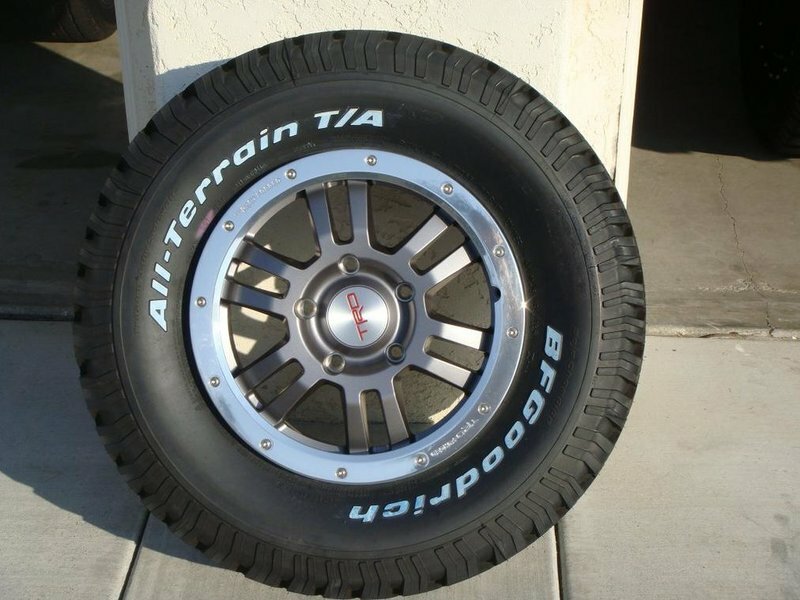 Replacing the stock wheels with after-market 18′s that have less backspacing is recommended. 20″ rims: 285/65 R20 – 4/10ths wider, 1.6″ taller than factory. 20″ rims: 305/60 R20 – 1.2 inches wider and 2.4″ taller than factory. There are Tundra owners running this size, but trimming is required (it’s a tight fit). Bead seat - The position where the tire rests and seals on the inside of the rim. Center Bore - The hole in the center of the wheel machined to match the hub of specified vehicles with hub-centric wheels and machined to a generic size with lug centric wheels. Hub centric - The center bore hole of a wheel matches the hub diameter of the vehicle. This centers the wheel via the center hole rather than the lug nuts. Hub centric ring(s) - A nylon insert for the center bore of the wheel that keeps the wheel concentric to the vehicle's hub during installation. Load rating - The maximum weight that the wheel is designed to support. To determine load rating requirements take the gross axle weight ration and divide by 2. Lug centric - When the wheel is centered by the bolt holes/ lug nuts of the wheel, rather than by the center bore. Lug centric wheels should be balanced from the bolt holes. Make - The brand name of the vehicle. For example, Ford, Chevrolet, Honda. Model - The particular style name of the vehicle. For example, F-150, Corvette, Civic. Mounting pad - The surface area on the back of the wheel's center that contacts the brake drum or rotor surface. MSRP - This is the manufacturer suggested retail price per wheel. The dealer sets actual retail pricing. Negative offset - When the mounting surface is closer to the disk/drum (Inside) of the wheel. Or the mounting pad is behind the centerline of the wheel. This type of wheel is commonly referred to as a deep-dish wheel. This offset is common in older vehicles and many of today's trucks and will bring the wheel/tire combination out away from the vehicle. Offset - The offset of the wheel is the distance from the mounting pad to the centerline of the wheel. Positive offset - The mounting pad is forward of the centerline of the wheel, towards the street side of the wheel. This is common in most front wheel drive cars and some newer trucks. Generally speaking a positive offset wheel brings the wheels closer to the center of the vehicle. Plus 1/ plus 2 sizing - A concept to improve handling and performance through the mounting of lower profile tires to wheels that are 1, 2 or even 3' greater in diameter. The overall ride height remains the same. Rim flange - The outermost edge of the wheel's rim that the clip-on weights attach to on most wheels. Safety bead - The raised area circling the rim of the wheel and located slightly inward from the bead seat. Spring clips - Push on retainer clips that hold the brake from on the disc rotor to the axle during transportation. Star pattern - The proper way for sequential torquing of the lugs in a 5 lug bolt circle. Torquing - The securing of the wheel/tire assembly to the automobile by the tightening of the wheel's lug nuts to the studs of the vehicle's hub. Custom wheels should always be torqued with a manual torque wrench (not an impact air wrench) to torque rating specifications followed by periodic re-torquing. Torque rating - The proper pressure to be applied in foot pounds when tightening lug nuts to secure the wheel/tire assembly to the automobile. Unsprung weight - The total weight of the vehicle not supported by the suspension system. For example wheels and tires. Wheel weights - Weights that are used to balance the wheel/tire assembly. They are either clipped, taped, or self adhered to the inside or outside of the wheel. Here's another way to look at this! Offset and backspace are essentially two different ways of looking at the same thing. They determine the location of the wheel and tire assembly when bolted to the vehicles hub. Offset is the measured distance between the hub mounting surface and the wheels center line. 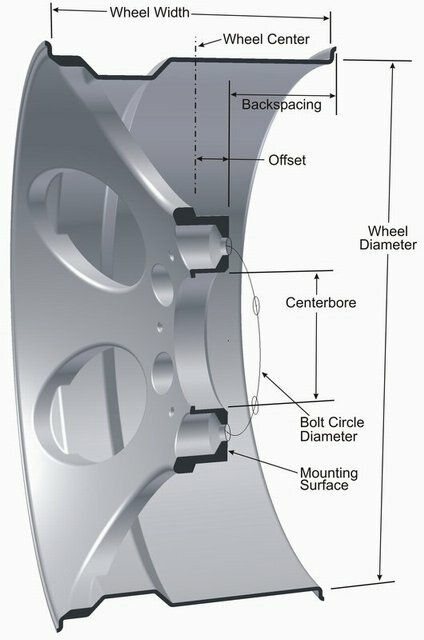 With X being the determined offset, the hub mounting surface on positive offset wheels is X amount forward from the wheel center line. The hub mounting surface on negative offset wheels is X amount backwards from the wheel center line. The hub mounting surface on 0 offset wheels is the wheel center line. Backspacing is the measurement from the hub mounting surface to the back edge of the wheel. Typically the higher the offset/backspace, the more the wheel will tuck inwards towards the suspension or away from the fender. The lower the offset/backspace, the more the wheel will push out away from the suspension or towards the fender. *If the offset on a 9" wide wheel is +12mm, the hub mounting surface will be 12mm forward from the wheels center line. Measuring from the hub mounting surface to the back edge of the wheel, the backspacing is 5.5"
*If the offset on a 9" wide wheel is -12mm, the hub mounting surface would be 12mm towards the back of the wheel from the wheels center line. Measuring from the hub mounting surface to the back edge of the wheel, the backspacing is 4.5"
First - add 1" to the rim width and then divide by 2 to find the wheels center line (you have to account for the wheel flange which is why you add 1" to the rim width) . Second - convert the offset which is in millimeters into inches. There is 25.4mm in 1 inch so divide the offset by 25.4. Lastly - add the converted offset to the wheels center line if the offset is positive for the correct backspacing. Subtract the converted offset to the wheels center line if the offset is negative for the correct backspacing. *9" rim width + 1" = 10"
Please note: the wheels center line is the backspacing for 0 offset wheels. ARKANSASMARINE, Inquiringone, phabej and 20 others like this. Mmmm Ballistic Jesters. Must, keep, Tundra, stock. speaking of setup, what the official BS and OS for the the tundy, also what are the bolt patterns? I have the 5 bolt myself on my 11 rock warrior. I will update the original post with stock BS, OS and bolt pattern. No way, never keep a truck stock. ARKANSASMARINE, Inquiringone, hotrod52767 and 1 other person like this. cmiller219, ARKANSASMARINE, Hi06silver and 3 others like this. Do you happen to know backspacing and offset on those wheels? Also approximately how far they stick out past the wheel well? Tundra 2003 - 2006: Offset: ##, Backspacing: ##"
Tundra 2007 - 2013: Offset: +60, Backspacing: 6.86"
Rock Warrior 2007 - 2013: Offset: +50, Backspacing: 6.4"
@csuviper Do you need the specs for factory wheels on a first gen or just forget? Just had to post up an initial crappy flip phone shot-higher quality DSLR pics to come once I get the truck back from the alignment shop! 1. Pro-Comp 2.5" front leveling shocks. 2. KMC Skitch 20X8.5, +35 offset. 3. General Grabber HTS 275/60/20 (33X10.50). Worth every penny! It came out better than expected-totally transformed the truck (see sig pic for before). DalTee and T-Rex266 like this. HighDesertTundra and blue16 like this. I have a 2006 tundra and just bought a 2.5" leveling kit. For now i have to keep the stock 16 " rims on, do you think I will have any problems with rubbing once i install the leveling kit? If you're just adding a lift, you aren't really changing anything in terms of what will rub. If you go step up to 285's you'll still probably be fine, but might have to notch the pinchweld a bit. So I have the TSS 20x9 +50mm offset rims. They came with 285 55 20s but I'd like to stuff some nitto mt's, 305 55 20s in there. Will I be able to do this? I do plan on a 3 inch lift at some point. 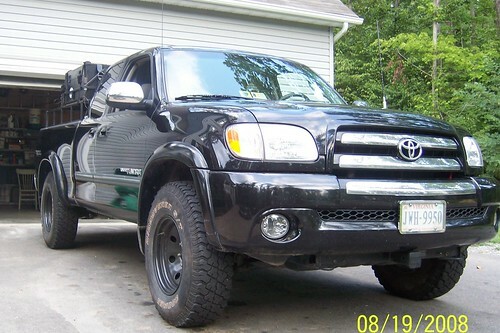 My other lesser choice was toyo mt 295 60 20s. 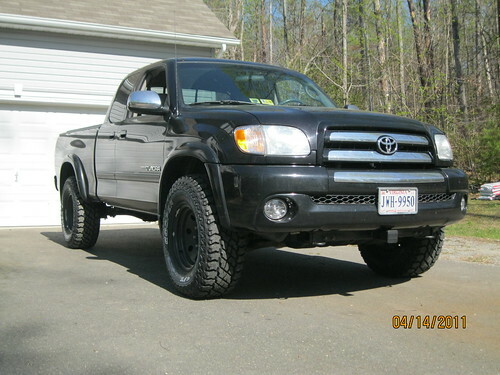 The toyos are 34s but a little skinnier than the fat nitto 33s. I'm ok with adjusting for the skid plate, but will the nittos hit my steering components? BMR tundra, JJ305, m_dot2on and 5 others like this. After a little more research it looks like the wheels have a +30 offset instead of 50. Maybe those tires will work after all. 3/1 lift. Goodyear Wrangler Duratrac 315/70R17 Tires. Factory TRD Rock Warrior wheels 17x8 +50mm offset. Blueknights75, 2ndgenny, Hi06silver and 1 other person like this. I went with 315/70R17 Goodyear Wrangler Duratracs with the stock RW wheels. I had some rubbing on the front wheel well liner mainly when turning in reverse. I decided to add 1.25" wheel spacers to give the truck a little better look with a wider stance. 2ndgenny, 11CMGray and TruckyTruck like this. wow, great pics man. was the pic with your upper control arm before spacers? I guess so huh. this is giving me hope that I can shove 305 55 20s on my stock rims. I finally crawled under the truck and looked on the back of my rim and they are +50 offset. I really want to keep these rims. Yes the pic was before spacers. Very tight but still cleared. I will have to get a pic after the spacers for you. Sutterhunter and TruckyTruck like this. So fuel rims... I think I like them. Until last night I had never considered a 20x10 rim, but for the first time, ive fallen in love with a rim. Ive not been a fan really of to many made for the tundra and really anything since 5 stars... that dates me, ha. I havent done any research except for fuels website and it doesn't really give offset numbers but the site said they were availible. I love these rims. The only thing im not sure of is what a 10 inch time will look like. I plan on doing a 3 inch suspension lift. DalTee and robie56 like this. Joey, could I see more pictures of your truck? I'd like to see just how far your wheels stick out. Do you have any lift on there?